This article is written by werothegreat, originally posted on the forum. Rats is my favorite Dominion card. — Donald X. 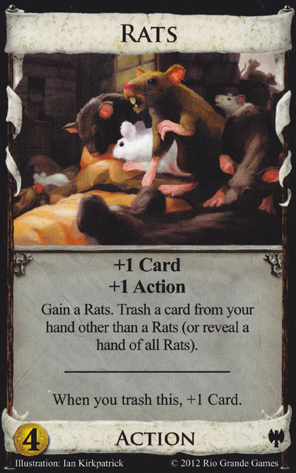 Rats, like most Dark Ages cards, require more finesse and thought than we’re used to dealing with in Dominion. In most other expansions, the thought goes into which cards to gain at what time. Once they’re in your hand, it’s a pretty simple decision in what order to play your cards (+Actions, +Cards, everything else), unless you have clashing Terminals. But cards like Fortress, Death Cart, Junk Dealer and Rats all make you think: “Do I really want to play this now?” And that’s good, right? So what is the point of Rats? Contrary to popular belief, it’s not just to be Donald X’s favorite card. There are several instances where you really want Rats. So what are they? Well, first we need to establish what Rats does. Rats replaces cards in your deck with Rats. More generally, Rats replaces cards (typically of a low cost) with $4 Action cards (which you don’t want to use too much). The point of Rats is to replace low-cost junk with higher-cost junk. Very quickly, I might add. If you buy one Rats in the first two turns, and use a Rats every time you see it, you should see a hand of five Rats within 10 turns. Obviously, you want to stop before you get to this point. So Rats trashes junk to give you other junk to feed to a Trash for Benefit card (“TfB” hereafter). Well, it depends on what kind of TfB we’re talking about. TfB cards that don’t care about cost don’t benefit very much from Rats. These would be cards like Moneylender, Spice Merchant, Jack of all Trades, and Altar. These either can’t trash Rats in the first place, or derive minimal benefit from doing so. But we have TfB cards that DO care about cost, and here Rats shines. The top three that should come to mind are Salvager, Apprentice and Bishop. All three of these convert the cost of a card into some resource – Coins, Cards and VP, respectively. All of these cards are rather bad at getting rid of your starting Coppers and Estates, and are even worse with Shelters, though Bishop would be the best of these three, since it actually gives a resource when trashing a $0 cost card. So why not trash this $4 card instead? That way, instead of +$0, +0 Cards or +$1/+1VP, you’ll get +$4/+1 Card, +5 Cards or +$1/+3 VP/+1 Card. That’s a lot better. Even cards like Remodel and Remake benefit. Do you want to trash two Coppers and get nothing, or trash two Rats and get two $5 cards? Rats turn Upgrade into a less limited Lab/University mashup. Since all of these cards are better when used on higher cost cards, they all do better with Rats. Even lowly Develop, oft derided as slow and cumbersome, gets a boost. Rather than getting nothing for those Coppers you trash one at a time, get a Silver and a $5 card right on top of your deck, after drawing a card! Junk Dealer does well with Rats. Not as well as the Big Three, given that Rats and Junk Dealer fill similar roles. But getting a +1 Card along with the rest of Junk Dealer is a pretty nice addition. Forge might have you thinking to turn two Rats into a Province, which is a cute trick, but if you’re ready to green anyway, that $7 might be better spent on a Gold. Also, that whole trick becomes much harder to pull off with Colonies. Perhaps the greatest combo here is with Death Cart – turn all those Coppers and Estates/Shelters into Actions you’re absolutely glad to get rid of every time. We have three Reactions so far that deal with trashing and/or gaining, and all of them work well with Rats. If you have a Watchtower in hand, you can trash the Rats you gain when you play a Rats, and get +1 Card to boot. So you’re cleaning up your deck, and depleting a pile. With Market Square in hand, you can lessen the damage of having to trash a non-junk card to a poor Rats play by gaining a Gold. Even if you’re trashing junk, gaining the Gold is awesome. Finally we have Trader. Now, why didn’t I include it in the Big Three? It’s the other trasher that cares about card cost. But the Action for Trader is really more of a facilitator for Big Money, and if that’s what you’re going for, you shouldn’t really be getting Rats in the first place. However, turning a Rats into four Silvers can be a nice supplement to whatever engine you have going on. The Reaction is also nice, replacing your junk with Silver instead of Rats, though this undermines the whole purpose of Rats, at least with regards to the Big Three or Death Cart – again, this would be a supplement. Which expansion heavily emphasizes Actions? Alchemy, that’s who! And Alchemy has two cards that go well with a card that fills your deck full of junk Actions. First is Vineyard. Turn all those Coppers and Estates into Rats, and now all those Vineyards are worth at least 3 points more! Just don’t trash any Vineyards with them. That would just hurt. Second is Scrying Pool. Scrying Pool works best if you can get rid of your Estates and Coppers and go for a money-less deck. Rats can do just that. Once you’ve Rats’d away all those starting cards, your Scrying Pools should draw your entire deck, except when snagging on Potions. It is therefore no accident that one of the Dark Ages recommended sets (“Infestation”) is Dark Ages/Alchemy. Another interesting strategy might be to use Rats to clear out your Coppers for use with Venture or Adventurer. The biggest weakness of these two cards is drawing Copper instead of your better Treasures. If those Coppers are Rats instead, they’ll be skipped. Likewise, Poor House in practice can only work if you trash all your Coppers, so you can use Rats to quickly de-Copper yourself into a monster Poor House engine (ideally involving Council Room and/or King’s Court). Another tactical component to Rats is the opportunity they give to autopile out. If you have 2 Rats and an empty discard/draw deck (or 1 Rat in hand and 1 Rat in discard), you can autopile the Rats pile. Play a Rats, draw a Rats, gain a Rats … lather, rinse, repeat. So if two piles are already gone, you can bang out the Rats for a surprise ending. But doesn’t that eat all your VP? Not necessarily. Rats can only chew on cards that are in hand, deck or discard. This means that anything elsewhere is immune to Rats. For instance, cards on islands are safe from being overrun by Rats. Likewise, cards that have been saved with Haven or Native village are also safe from the Rats onslaught. Another fun shot are dual-type cards already in play. Got all of your Nobles or Great Halls into the play area? Great, Rats can’t touch them this turn. Played out your Harems with a Black Market? Great, rats can’t eat them. Additionally, any VP bought in your final buy phase are safe. A final protective measure is Fortress, just keep using the Rats on the Fortress (which returns to hand afterwards) and keep churning the rats, this can allow you to have a full hand of green, and still autopile on Rats. So if you can protect VP out of deck/hand/discard, you need to be very careful about emptying two piles. Your great bridge engine may well lose if the opponent can get two Rats going and win with 5 nobles after you’ve emptied the nobles and village piles. You’ve depleted the Island and Fishing Village Pile, great, but now he can autopile with Rats any time he has more points on his islands than you have in your deck (even if you are about to start hitting triple colony turns). Likewise, with chip setups, you need to be careful as two Rats can allow for autopiling whenever the one guy can win. For instance, let’s say we are mirroring on Goons and building up to engines (say Council Room/King’s Court), we empty a pile and I then buy two Rats and end my turn. Now you face a problem – you can cash out your Goons engine by buying scads of copper or you can keep building. If you cash out, I just keep building (more Goons, more buys, whatever) and cash out later for the win (you will have real trouble lining up all your Goons if over half your deck is Copper). If you don’t cash out, then I play all my action cards, then auto-play through the Rats pile, and buy out the Estates (Curses or whatever) and spam buy Coppers. Unless you had a huge lead (very hard to come by in a Goons mirror), you just lost. Even if you buy two Rats now, I can still cash out and then Rats autopile for the win. Without a Goons engine, it becomes harder to generate the action-cash/buys needed to empty pile two (the third being Rats), but the concept is the same, have two Rats in hand and an empty draw deck/discard and you can force game end if you are winning and two other piles are empty. Any time you have a lean deck and two piles are going to empty before you start buying big VP can make Rats a surprise game ending move. Island, Fishing Village, Minion, City, Curse givers in big draw engines, etc. can allow for a two Rats autopile to end the game and let you win 6 – 3 or better. This, of course, is stronger if you have card gainers built into your strategy that can add the Rats on the fly. For instance, say you are playing University/City/Familiar. The curses will pile quickly and the cities may go before you buy any provinces. If you have three Unis and two Familiars you may well be able to pile Cities, curses, and then gain two Rats to drain all 3 piles in one turn. Buy a duchy in your buy phase and win by a point or so. If all your junk is Rats, certain Attacks suddenly become less painful. Fortune Teller and Rabble clear out all those Rats from your next hand. Saboteur and Knights are suddenly both improving your deck and increasing your next hand. But Rats can also be used to mitigate Curses. Even as the only trasher, it’s better to have a Rats in your deck than a Curse. Sea Hag is most vulnerable to this, given that you’ll know that the next card you draw with Rats will be one you want to trash. However, do not use Rats to clean up after Looters. Unless you have a Big Three, it would be much better to have a Ruins (which gives a marginal beneficial effect) than a Rats. Ruins do not effect your score, unlike Curses, so don’t feel the need to get Rats if they’re the only trasher. Also, what hand would you most want Possessed? A hand of five Rats! Then your Possessor can’t do anything without giving himself Rats, and you’ll (hopefully) have a better hand for your turn. If you’re going to use Masquerade with Rats, remember to only send a Rats to your opponent if he did not play the Masquerade; otherwise, he’s just going to trash it and draw a card. What if there are only straight trashers on the board, like Chapel? In that case, you should probably just go with Chapel. Chapelling Rats would draw you some cards, but it would be faster to just Chapel everything away, and spend your $4 on something that will build your economy. The one TfB card that cares about cost that you DON’T want to use on Rats would be Procession. Sure, you get a $5 cost card, but you also get two Rats, and have to trash two cards in your hand, which, by the time you get both a Rats and a Procession, you may not want to do. Rats/Ambassador defeats the whole purpose of Rats. Consider Ambassador to be a straight trasher, like Chapel (in a loose sense). If you’re going for that, you don’t want Rats anyway. If your jig is to buy junk to send to your opponent, Curses are much cheaper and will hurt him much more. What if there are no other trashers on the board, outside of the options listed above? DON’T BUY RATS. Let me repeat that. DO NOT BUY RATS IF THEY ARE THE ONLY TRASHER (outside of the aforementioned cases). So I’ve bought Rats, specifically to trash it. When do I? Buy the Rats within the first two turns, and use a Rats every time it’s in your hand with stuff you want to trash. At the first opportunity, buy your TfB card. Every time it’s in a hand with a Rats, use it on the Rats. Once you have your TfB card, only use Rats if it’s in a hand without that TfB card, and with remaining junk. In the highly unlikely event that you trash your last Rats before all of your junk is gone, don’t worry. You’re leaps and bounds in the right direction anyway. You should only ever purchase one Rats. All your other Rats come from playing a Rats. What about those non-trashing cases? Use Rats whenever you have junk to trash. Be smart with the Rats. If you don’t have anything you want to trash to them in hand, don’t play them. It’s highly unlikely that the next card you draw will be one you want to trash (unless you’ve Spied ahead earlier), so just regard it as junk for that turn and ignore it. Remember: you don’t have to play a card in your hand. P.S. The Rats pile has 20 cards in it. Don’t forget that. This entry was posted in Dark Ages and tagged rats. Bookmark the permalink. Vineyard’s an obvious one, but no mention of Rats in a Gardens game? AFAIK, you’d need to time it right that you don’t get stuck with a bunch of Rats you can’t use effectively with the game going on, but you also wanna grab many of them before the game does end. I also figure you should be very careful about playing Golem when Rats are in your deck. I’m not sure Rats works all that well with Gardens, since Rats usually trashes a card for every card you gain. And by the time you’re getting hands of 5 rats, you’re having to trash your gardens to use them. But the Rats pile will be gone quickly, and then the Rats are dead cards if you don’t draw ’em with a Fortress, and a 0-VP Great Hall that cost $4 if you do. Seems like that would gum up a Gardens deck so much that it wouldn’t be able to close the game out. That is, the pile will be gone quickly if both players go for that strategy. If it’s only you, then I think having 20 Rats in your deck would eventually leave you unable to buy a Gardens on most hands and probably even unable to buy an Estate on many others. Rats doesn’t work well with gardens. They don’t really increase the number of cards in your deck, they merely replace other junk with rats. But in a gardens deck you will prefer even copper over rats. Replacing copper with rats will just decrease your buying power even more to the point where you can’t even afford to buy gardens. Had a wonderful game where I beat my opponent who played Rats/salvager. I won with Rats/Mercenary. Also need +buy to always have junk to trash when you play your rats. Depending on what else you have to pass, I don’t necessarily agree with this. Yes, he probably is just going to trash the Rats and draw a card, unless he has something even worse to trash; but it still gets the Rats out of your deck, and +1 card after the opponent has already played a terminal may not help him all that much anyway. Certainly you should pass Rats before you deprive your own next hand of something actually valuable, like Silver; and you’ve probably already fed your Coppers/Estates/Shelters to Rats. On the other hand, if you’re playing Rats at all, it’s probably because you think they can at least theoretically be a valuable resource for one of the other trashers. If you actually have the Salvager in your hand with one Rats, then you should probably keep that together — subject, of course, to what else you have to choose from. Rats also have an added benefit of helping to cycle your deck. You have to be careful because you don’t want to just play them every time you see them, but when you do play them it helps cycle the deck which can be an advantage. I actually like Procession with rats, but you do have to be careful. A nice three card combo can be procession / fortress / rats. That does assume you have something else to trash those rats later. But if you have the fortress in your hand you don’t actually have to lose a card. And maybe you do have something you want to trash. But you gain two rats and lose one rat which is a net increase of one rat just as if you had played only rat. Then you get the additional benefit of grabbing a $5 card and drawing an extra card. That $5 card could be an important engine piece that would be hard to come by in a rats deck. Also, procession a rats if you do trash two cards actually decreases deck size trashing 3 cards and gaining 2. Still if procession is the only other trasher on the board don’t buy rats. But if you do have a mercenary or a junk dealer or grave robber it might work. Rats can work well with Forge also. Forge turns a pair of Rats into a Province, and draws two cards. Neat idea, but how do you propose to get a $7 card when you’ve slowed yourself down by buying Rats? Don’t forget that you now also need to draw your Forge with 2 Rats, which is a 3-card combo. So unless you have a bunch of drawing support or a ton of Rats (which brings you back to the problem of getting the Forge in the first place), the chance you can pull this off consistently enough to win is slim — and if you have a bunch of drawing support, chances are good you can just ignore Rats. Well, for starters, you can get the Rats after you get the forge. Say you hit baron/silver/copper, you can buy the forge and you have a higher than average chance of hitting 4 coin on the next turn. Buy the Rats, play it once; next pass play the 2 Rats and forge the new ones. It won’t be common, but it is doable. Other shots can include things like Haven or Count to bounce back Rats/Forge until the combo lines up. I’m thinking that if you’re able to get a Forge, you should be doing well enough to forgo the time it takes in getting Rats, matching them up with your Forge, and getting the extra benefit from trashing Rats as opposed to just forging the junk cards out in the first place (sort of like why bother with Rats when you could just buy Chapel if it’s available and trim your deck that way). The most obvious example is probably Tactician. It’ll give you an easy $7 hand for Forge; then you don’t have to buy anything but more Rats and probably a second Tactician. Between Tactician cycling, the ability to play Rats on your Tactician-discard turn, and 10-card hands, it should very quickly become trivial to Forge Provinces on most turns. I don’t understand this question because Rats isn’t a way to trim your deck at all. In most respects it is just replacing one junk card with another. When buying provinces, the sequence of playing 2 Rats (gain 2 Rats), Forging 2 Rats (gain Province, draw 2 cards) is the equivalent of +8 coin, draw 2 cards, – 1 action, and -2 buys (to get coppers for Rats food). To get an equivalent effect you need some serious fireworks. Rats add 4 coin in value for effectively -1 buy, not many things can compare for that. If you have the setup (cheap, easy +buy, reliable draw, and forge), then Rats are pretty easy to get running. Is that niche? Sure. But there are some simple setups like tactician or wandering minstrel that make it fairly easy to run. And really, -2 buys only applies sometimes. It’s not always bad to ditch coppers. I like rats as a defense idea. I think they are also good at making games feel closer than they might be since whoever uses them to get an early lead could easily fall victim to them. Rats/Death Cart is a fine combo, but it needs some filtering support to be worthwhile. Cartographer, Warehouse, Lookout, Cellar — any of these will work. Without them, it’s too slow to be competitive; you’re better off just playing Big Money. Band of Misfits works well here, since it can pretend to be a Death Cart whenever it’s in your hand with Rats, though this still does need some filtering support, though not as much. How about Rats+Watchtower? Immediately trash the gained Rats, and now you have a Lab + trash a card from your hand. Rats and Jack of All Trades works surprisingly well, as what JoAT really lacks is the ability to trash copper. Play Doublejack and get Rats later in order to increase the overall value of your deck. You should never have more than a few rats in your deck at a time; if you Rats too quickly, you hurt yourself overall, whereas if you trash all of your rats too quickly, you will not get the benefit from having them at all. Jack’s ability to draw back up to 5 cards works well with most non-terminal trashers, clearing out lower-value cards in exchange for extra draws when it comes time to replenish your hand. This strategy is especially applicable in Colony games, where Doublejack is hindered by being silver-dependent and therefore it is much harder to get Colonies than Provinces. It makes it a lot easier to transition into a high-value powerful buy, faster than most BM or engine strategies. I can imagine this working in Colony games, but in Province games it seems questionable. If you buy your second Jack before your first Rats then it’s very possible you don’t get your first Rats until after the second reshuffle, on turn 5 or later. In that case your Rats won’t trash its first victim until something like turn 8, and if you’re looking forward to trashing the Rats itself, that won’t be sensible until even later; something like turn 10 or 11 or even later. Vanilla DoubleJack ends the game ridiculously quickly; off the top of my head I think it’s like 12 turns, so I’m not sure that you have time to see the benefits here aside from a tiny bit of cycling. If you’re lucky enough to draw your Rats and Jack in the same hand then Jack can save your hand from the damage done by Rats, and maybe more. So maybe it’s not so bad that the long term plan doesn’t come to fruition. But could you have done better just buying Silver instead? I suspect you could. I’m thinking that if you get $4/$4 on your turns 3-4 in a DoubleJack game, you could consider buying the Rats on turn 4 (although even still, Rats is pretty slow), but otherwise you probably pass it up. There might be an exception if you have a Curser or something like that slowing the game down a little. The other option is to buy your first Rats earlier; perhaps as part of a more complex strategy involving only one Jack. I haven’t read all the comments, but i would like to add that Rats can work well in a Deck built around Library. I have tried this in the Basic/DA default set, i can say it’s not bad at all. I just buy a Rats/Silver (4/3) or Rats/Nothing (5/2) in the first turn, then buy a couple of silvers. As soon as i have $5 in my hand i buy a Library. I stop using rats as soon as i am left with 2 or 3 coppers from the initial cards ( i dont want to have too happen seeing too many rats in my hand). Then i just buy money and 2 or 3 more Libraries, as my deck gets thicker. The result is that i will have trashed most of my initial cards and my Libraries will simply ignore the Rats as if they are not in my deck. Another combo I haven’t seen mentioned much is Rats / Forager. You can buy those at the beginning of the game, feed Coppers and Shelters to your Rats, and then feed Rats to your Foragers. If you have the guts to trash a Silver and Gold ASAP by the 4rd or 5th pass through your (small-sized) deck you should be playing multiple Foragers and grabbing Provinces every turn or so. Plus, Rats and Foragers are both non-terminal, so you have room to use another action card if you want. I tried Count/Rats and it worked pretty well. I think Forge would have a similar synergy. The key here is if the board lacks a cheap trasher. You could hold on to your starting cards until you can afford the Count (or the Forge), but then you’ll have a lot of cards and might not get the best hand to use the Count on. But Rats would chew through all the cheap cards quickly, and then you can clean up several in one shot with the Count. Yes, you’re gonna trash the Rats for no benefit except the card draw, but if they were Coppers you wouldn’t have even had that benefit. Forge could cause some dilemmas: trash 4 Rats for nothing? Or trash fewer Rats to earn better cards?